A pervasive challenge throughout the Caribbean region is “light pollution”, which can be defined as the introduction of artificially produced light into areas where it is neither needed nor desired. At nesting beaches, light pollution is known to modify sea turtle behavior and even discourage egg-bearing females from coming ashore to nest. Beachfront lighting also strongly affects sea turtle hatchlings, luring them inland and away from the sea where they succumb to predators, dehydration, and other hazards. Bonfires are also a concern, as hatchlings can be attracted to and burned by the flames. Fortunately, reducing light pollution is among the most manageable of conservation practices. Artificial light does not need to be eliminated if proper light management techniques are adopted. Artificial light only becomes a problem if the light or glow from the source can be seen from the beach during nesting and hatching seasons. “Problem” light sources directly or indirectly produce a glow on the beach that can negatively influence sea turtle behavior. Direct lighting is a source that is visible from the beach, while indirect lighting illuminates buildings and landscaping which can be seen on the beach. The cumulative effect of lights from an area creates a sky-glow that can also affect sea turtles. Sky-glow can emanate from lights located inside and outside of buildings, as well as from street lights and recreational facilities (e.g., tennis courts, baseball fields) several miles away. Hotel and resort projects in their initial stages of development should be encouraged to incorporate good lighting techniques into their building plans. The best practice is to prohibit lights near the nesting beach area. While it may not be practical in many cases to eliminate all lights near the beach, developers are often receptive to new ideas when informed about beach lighting and its potential consequences. With this in mind, hoteliers and developers, along with their architects, should discuss their lighting plans with local and regional experts. 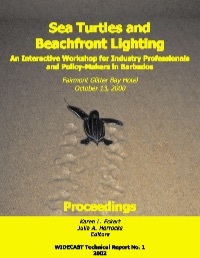 Developers should also be aware that Caribbean governments are increasingly requiring “sea turtle friendly” lighting for all new beachfront development. Existing hotels and resorts can take several steps to manage light pollution. Conducting an inspection is the first of these steps. First, demarcate the area to be inspected (e.g., the boundary lines of the property) so that a census of the types, locations, and numbers of light sources observable from the beach can be conducted. The surveyor should conduct a preliminary daytime inspection to determine the exact locations of light sources that may be harder to verify in the dark. Along with placement, the surveyor should include detailed descriptions so that each light source can be located during follow-up inspections in the future. Because the effects of some light sources, particularly indirect sources, are difficult to evaluate during the day, a night-time inspection (preferably on a moonless night) follows the daytime inspection, using notes taken during the day as a guide. Night-time inspections involve searching for visible light while walking the length of the nesting beach. Each source of light is categorized as either “direct” or “indirect”, depending on how it appears on the beach. If the observer notices a bulb or glow from a light source, then this source qualifies as a direct source. 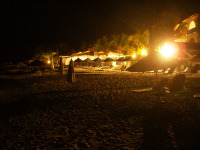 If an illuminated building or landscaping is visible from the beach, the illumination is described as an indirect source. 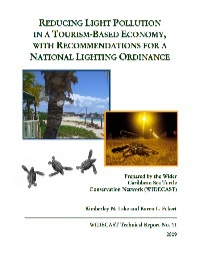 For details on how to conduct a lighting survey, as well as comprehensive recommendations for reducing light pollution on Caribbean beaches, published lighting assessments from Barbados and Anguilla are helpful. 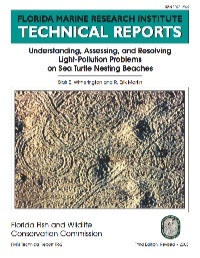 A comprehensive lighting inspection should occur at least annually, just prior to the sea turtle nesting season. A follow-up night-time inspection should occur two weeks after the initial inspection in order to identify lights that may have been missed previously. Potentially problematic lights should be remedied quickly, before they affect sea turtle behavior. 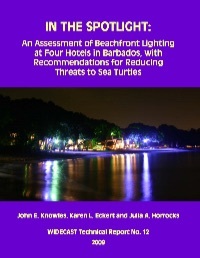 The following are light management techniques that can significantly reduce the potential harm to sea turtles from outdoor or external lights associated with beachfront properties. The initial cost of retrofitting may be high, but the investment is repaid by reducing the frequency with which light bulbs need to be replaced and reducing energy costs. If supplies for alternative lighting schemes are locally unavailable, consider networking with other property owners and developing a bulk supply order. Negotiate with the hotel association, tourism development agency, or other industry group to import the supplies at discounted rates. Invest in Alterative Light Sources – Sea turtles are less sensitive to certain types (and colors) of lights. All metal hyalites can have adverse effects on sea turtles and should be replaced as a priority. High pressure sodium vapor lights also strongly affect sea turtles, and should only be used in areas not visible on the beach. Incandescent lights have moderate effects on sea turtle behavior, except for “bug lights” which are tinted yellow. 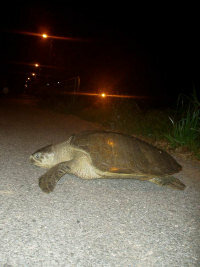 Low pressure sodium vapor lights (LPS) are the least detrimental to sea turtles. Monochromatic yellow in color, LPS lights have the longest wavelengths, which sea turtles do not detect as readily. The best choice, if light is necessary, is often LPS lighting. Lower Lights – The most visible lights (from a beach standpoint) are lights mounted high on buildings or poles. In many cases, simply lowering the height of the light may solve the problem. Lowering and directing light to precisely where it is needed can also be more aesthetically pleasing, more functional, and more cost-efficient from an energy usage standpoint. Use Directional Fixtures – Some lights, such as carriage lights or globe lights, disperse light in every direction. Be thoughtful about your lighting! Do you really need to illuminate (and pay for!) the entire night sky? Directional fixtures applied to broadcast lights can focus the light downwards and away from areas visible from the beach. Shield Lights – Shielding an open light source may reduce the amount of light directed onto the beach. Simple screens (such as the use of aluminum flashing) or planting vegetation (such as an ornamental hedge) can effectively shield lights. Be creative! Soften lights with locally-made basket shades, make greater use of wall sconces, and/or recess lighting in architectural elements. If shielding is impractical, then these lights may need to be substituted with lower, directional lighting. Install Motion Sensitive Lights – When night-time lighting is indispensable, particularly from a security standpoint, installing lights with motion detectors reduces their detrimental effect on sea turtles because of the relatively brief duration of their illumination. Moreover, motion sensitive lighting carries the element of surprise, conveying a distinct advantage to posted guards who remain in the shadows. Motion-lighting provides light only when necessary, and is ideal for low-traffic areas. Remove Unnecessary Lights – Lighting inspections may determine that some lights are unnecessary or redundant and can be removed or turned off, saving money and benefiting both ambiance and sea turtles. Try to avoid the use of purely decorative lighting, such as lights that highlight vegetation, in places that can be seen from the beach. Time Restrictions – Restrict usage or extinguish lights during peak sea turtle nesting and hatching seasons, and especially during peak hatching hours (typically 7-11 PM) when hatchlings are most likely to emerge from their nests. Area Restrictions – Limit beach lighting to areas of the beach that are not used by sea turtles, keeping in mind that even distant light sources can influence hatchling orientation. Window Treatments – Interior lights, especially from high-rise buildings, can strongly affect hatchling behavior. Hoteliers can remedy this problem in various ways, including the use of blackout draperies (or heavy, opaque curtains), shade-screens, and/or tinting or using shading film on windows. Guests need to be reminded to close the drapes during sensitive hours. If window-tinting is an option, tint the windows to meet the 45light transmittance from inside to outside standards – this will reduce light leakage, as well as decrease energy loss and cooling costs. Vegetation – Plant a decorative vegetation buffer between the beach and any buildings, with the specific aim of blocking light emanating from built structures. Use native plant species whenever possible. Lighting Ordinance – Advocate for a national Lighting Ordinance! A recent lighting assessment of hotel properties in Anguilla offers recommended wording.